KTM updated this little rascal for 2017, but we’re just now getting our hands on the new bike. Basically it’s got even more of the things we liked and less of the ones we didn’t – more accel and decel, and therefore the RC’s an even bigger bargain than before if minimalist corner-carving is your thing. KTM doesn’t come out and say the new RC (actually it was upgraded for 2017) has more power. All they say is the bike has a new side-mount exhaust system and revised settings – but our dyno doesn’t lie. 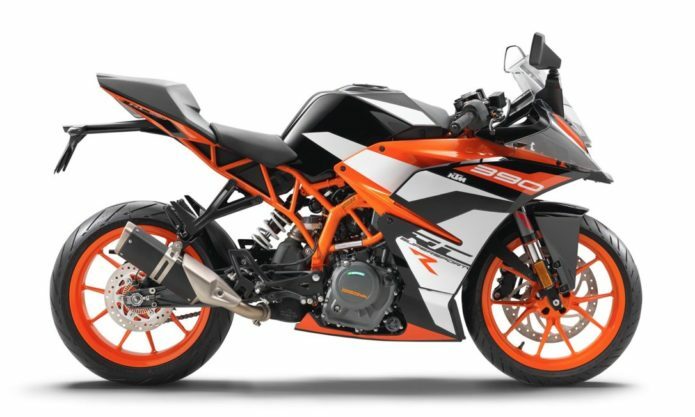 The new KTM makes 42.0 horsepower at 9900 rpm, to our 2015 model’s 39.7 at 8900 rpm: 2.3 hp doesn’t sound like much, but when you’ve only got 40, it represents 5.5% more juice. That’s pretty amazing power from a 373cc Single that KTM says weighs just 79 pounds. Peak torque is almost identical – 24.4 pound-feet for our new bike vs. 24.6 for the 2015 – but the old bike’s peak was at 7000 rpm instead of the new one’s 8300. There’s also a new slipper clutch, which makes exploiting the RC’s manic cornering ability even maniccer. A slight reduction in trail, to 88mm, allied with the RC’s steep 23.5-degree rake and short 52.8-inch wheelbase, results in a motorcycle that reacts with catlike reflexes to your inputs. The fact that the whole package weighs just 365 pounds before you climb on is another big performance advantage. Replacing the previous 300-millimeter front disc for a 320mm unit, clamped by a strong radially-mounted four-piston caliper (mounted to a beefier-than-it-needs-to-be inverted fork with 43mm tubes), lets the lightweight RC decelerate even harder than before. Wider mirrors, a thicker seat, adjustable levers, bolder new graphics and an LED tail light – none of those help you much on the race track, but they do go a long way toward making the RC a more comfortable and useable street machine. The SSP 300 Race Kit contains more than 230 individual parts, allowing the ability to custom tune the bike for all tracks and conditions – for only €11,000! KTM gives you the option, for a price of course, to take your lightweight roadracing adventures as far as your bank account dares, with a bunch of hop-up parts and kits for the RC. Not only should an RC390 R be here soon, with fully adjustable WP suspension and a stouter engine, there’s an entire SSP300 kit in the works that allows you to roll your own World Supersport bike.